Yes! You can shop with Undercover with confidence. We work with Stripe.com which offers safe and secure credit card transaction for our customers. Stripe is Payment Secure and PCI Compliant that follows all protocols with sensitive customer data. Do I have to create an account to order from Undercover? Each promotional e-mail that we send from Undercover will include an "unsubscribe" link for your convenience. You can also change your preferences in your account, or give us a call and we can take care of that for you. Please check that your Undercover product has been received in good condition. If your product has been damaged in shipping, a damage report must be reported within 3 business days of receiving your item. If a damaged item received is reported after 3 days, Undercover cannot settle any shipping damage dispute. Please retain all packaging material your Undercover product was received in, should FedEx have to inspect the item for a claim. FedEx will not settle any claim unless the original packaging can be inspected at the site of where the shipment was received. If the item you received was drop shipped by Undercover for one of our distributors and was received damaged, please contact us or the company from whom you bought the product immediately. If you have received an incorrect item, please contact our customer service department at 866-900-8800 with the information of whom you purchased your product from and we will arrange to have the item picked up and replaced for you. You may email info@undercoverinfo.com If you have attempted to install your Undercover product, or any Undercover product has already been installed on your vehicle, Undercover will not accept any return. All Undercover items have to be returned unused, in the same packaging in which they were originally received with all labels and packing materials included. Undercover has a limited warranty on all products which covers manufactures defects in materials or workmanship. Random acts of god are not covered in any capacity under the Undercover limited warranty period. In the event you decide you do not want the Undercover product you have purchased and it has not been installed, and is still in the original packaging, you have the option to return the product at your expense. Undercover will charge a 20% restocking fee for all such items being returned to stock. Undercover will not accept any items back without an approved RMA #. Please have whomever you purchased your item from, obtain an RMA # prior to returning the item. Any item returned without an approved RMA # will not be accepted. All orders placed online at undercoverinfo.com can be returned to: 59 Absolute Dr. Rogersville, MO 65742. To return the merchandise you will need to contact Undercover customer service to receive a RMA number. If you have received an incorrect item, please contact our customer service department at 866-900-8800 with the information of whom you purchased your product from and we will arrange to have the item picked up and replaced for you. Please contact customer service at orders@undercoverinfo.com or call us at 1-866-900-8800 Mon-Fri 8am-5pm CST. Please note if your order was delivered by freight carrier, you will need to inform the driver or note the invoice of any visible damage. Please contact customer service at 1-866-900-8800 Mon-Fri 8:30am - 5pm CST. You can contact customer service at 1-866-900-8800 Mon-Fri 8am - 5pm CST., or by emailing us at info@undercoverinfo.com. Although it is rare, occasionally an item will show as delivered, but you did not receive it. If this happens, please call our Customer Service Department 1-866-900-8800 Mon-Fri 8am-5pm CST. We can investigate the issue further and may show a location (front door, garage, side door, neighbor) on the delivery receipt, as well as a signature if one was received. If you are still unable to locate the item, we will file a lost package claim on your behalf with the carrier. They will then take steps to locate your item. In most cases, the item is located within 2-3 business days. If after an investigation the item is indeed lost, Undercover will reorder all lost items for you. Yes we charge tax on orders located in MO. If you were missing parts when you received your cover, call Undercover immediately, please do not return product to the retailer. Our Customer Service Department will be able to assist you in an expedient manner. The ArmorFlex is weather resistant, utilizing rail channels and drain tubes to move water away from the bed. Ultimately, no folding cover is completely waterproof as there are tailgate gaps and other areas that may allow some intrusion. The ArmorFlex can usually be installed in about 45 minutes. Can I drive with the cover in the upright position? Yes. The ArmorFlex utilizes strut mounts to stabilize the cover while driving. Will the cover work with a 5th wheel hitch? Yes. There are two available cover positions while pulling a 5th wheel. Upright and ¾ bed access. How fast can I drive with the cover in the upright position? We do not assign a speed rating to the ArmorFlex in the upright position, but it is well equipped to handle legal interstate speeds. What is the warranty on the ArmorFlex? 5 Years on workmanship and materials. 1 year on hardware. Can I see out the back window with my ArmorFlex fully upright? No. The cover in the upright position will block view out the back window. How easily removed is the ArmorFlex cover? Simply unscrew the two elevator bolts and lift! How can I get the side seals to lay flat on the ArmorFlex Cover? After a day or two, direct sunlight will be absorbed and help the seals lay flat. Do I need to drill into my truck when installing the ArmorFlex? No. The ArmorFlex utilizes clamps and a no-drill installation. Does the ArmorFlex work with a standard toolbox? No. ArmorFlex cannot be installed with a toolbox. How secure is the ArmorFlex cover? The ArmorFlex secures your cargo with the help of a tailgate lock. The only access point is the pull cord underneath to open the cover. If your tailgate is locked, your cover is locked. Where is my ArmorFlex manufactured? All UnderCover products are proudly made in the USA. 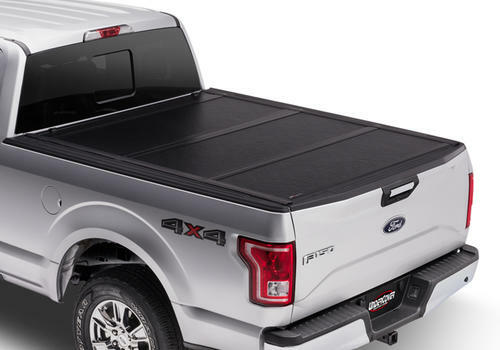 Is the ArmorFlex compatible with my bedliner? Yes. The ArmorFlex will work with BedRug, spray-ins and any under the rail bed liner. 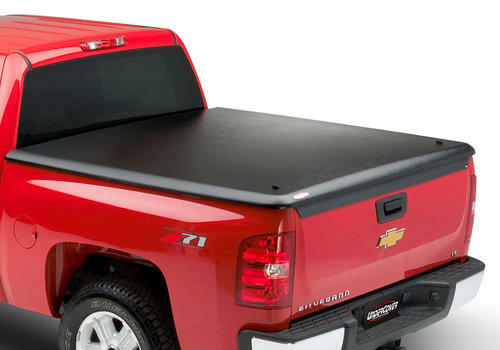 ArmorFlex is also compatible with many aftermarket bed caps. What is the install time on the Flex? Yes. The Flex utilizes strut mounts to stabilize the cover while driving. We do not assign a speed rating to the Flex in the upright position, but it is well equipped to handle legal interstate speeds. What is the warranty on the Flex? 3 Years on workmanship and materials. 1 year on hardware. Can I see out the back window with my Flex fully upright? How easy is it to remove my Flex cover? How can I get the side seals to lay flat on my new Flex? Do I need to drill into my truck when installing the Flex? No. The Flex utilizes clamps and a no-drill installation. Does my Flex work with a standard toolbox? No. Flex cannot be installed with a toolbox. How secure is my Flex cover? The Flex secures your cargo with the help of a tailgate lock. The only access point is the pull cord underneath to open the cover. If your tailgate is locked, your cover is locked. Where is the Flex made? Is the Flex compatible with my bedliner? Yes. The Flex will work with BedRug, spray-ins and any under the rail bedliner. Flex is also compatible with many aftermarket bed caps. How does the Ultra Flex differ from the Flex? The Ultra Flex has many different features than the Flex. Ultra Flex has a matte black finish, carpeted under panels, universal tailgate operation and an L-Rail install. The cover also comes with an integrated luminous rail light system for enhanced night vision. The Ultra Flex panels are made of aluminum providing strength and durability. What is the install time on the Ultra Flex? The Ultra Flex can be installed in about 45 minutes. Is the Ultra Flex dent resistant? Yes. The Ultra Flex panels are the thickest panels in the industry. Dent resistant, not dent proof. Can you open and close the tailgate with the cover in the closed position? Yes. The Ultra Flex provides dual action tailgate seal for easy operation. 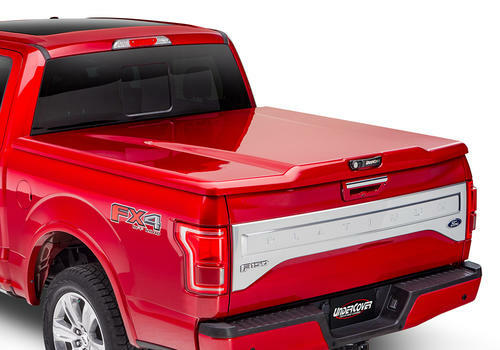 The tailgate can be opened and closed with the tonneau in the closed position. What are the Ultra Flex panels made out of? Aircraft Grade Aluminum coated with a matte black finish. Where is the Ultra Flex made? How easy is it to remove my Ultra Flex cover? Is the Ultra Flex compatible with my bedliner? Yes. The Ultra Flex will work with BedRug, spray-ins and any under the rail bedliner. 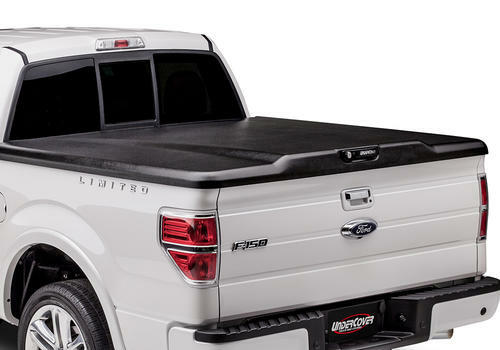 Flex is also compatible with many aftermarket bed caps. How can I get the side seals to lay flat on my new Ultra Flex? After a day or two direct sunlight will be absorbed and help the seals lay flat. How do I change the batteries in my B-Light system? Remove the battery pack/switch panel from the hook and loop attachment. Unscrew the one screw and replace the batteries. Can I open the tailgate with the cover closed? No. 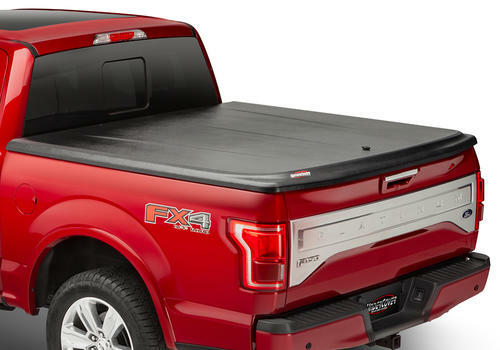 The cover wraps over the tailgate for security and weather resistance. How do I change the batteries in my light? The light is charged with lights similar to watch batteries. Simply remove the two screws, unhinge the back plate and replace the batteries. How does the SE differ from the Classic? 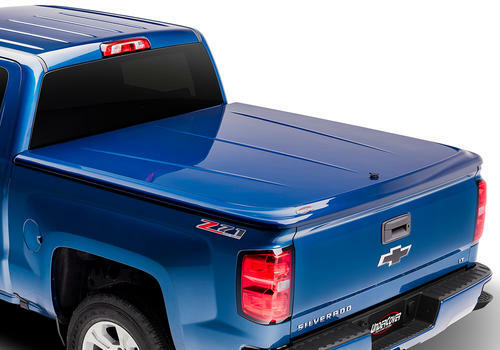 The SE has design lines on the top sheet with a fin at the tailgate for a sporty look. The SE also utilizes a single point locking system as opposed to dual locks. What is the warranty on the SE? The SE has a 3-year warranty on workmanship and materials. 1-year warranty on hardware. What is the warranty on the Classic cover? The Classic has a 3-year warranty on workmanship and materials. 1-year warranty on hardware. How long will it take to install the Classic cover? It takes about 45 minutes to install. Is the Classic cover waterproof? The Classic is weather resistant. The design of the cover goes over the bed caps and a double bulb seal on the underside is designed to help keep moisture out of your bed. How strong is the Classic cover? The cover is strong and durable enough to handle any snow load. We do not have a load rating but common sense goes a long way when determining what the cover can handle. Can I drive with the cover open? It is not recommended to drive with the cover in the open positions or tied down. This puts pressure directly on the front hinges and has been known to break the rivets in the plate. What is the install time on the Elite? The Elite can usually be installed in about 45 minutes. Can I purchase the carpet separately? No. Due to the complexities of the install we do not offer the carpet separately. The Elite is weather resistant. The cover is designed to go over the bed caps and a double bulb seal on the underside is designed to keep moisture out of your bed. Can I paint my Elite cover? Yes, but for a smooth finish our Elite LX is the premier offering in our paint to match line. Simply remove the light from its housing. Remove the plate on the back of the light and replace the five batteries. What is the paint warranty on the Elite LX? The Elite LX has a lifetime warranty on paint. Is the Elite LX waterproof? The Elite LX is weather resistant. The cover is designed to go over the bed caps and a double bulb seal on the underside is designed to help keep moisture out of your bed. What is the paint warranty on the LUX? The LUX has a lifetime warranty on paint. Can I get a codeable lock for the LUX? No. The BOLT lock will not fit in the LUX. The cover should come with keys that lock and unlock your LUX. Can I use products from companies other than Rhino Rack? Yes. The RidgeLander crossbars are compatible with T-Slot accessories from Yakima, Thule and others. How long will it take to install this cover? Install time usually takes around one hour. What is the weight rating for the RidgeLander? The RidgeLander supports 250 lbs evenly distributed. How easy is it to remove the RidgeLander? The RidgeLander removes in minutes. Simply unscrew the spindle from the bracket and lift the cover off. Can I raise the cover with cargo on top? UnderCover recommends unloading all cargo before raising the cover. 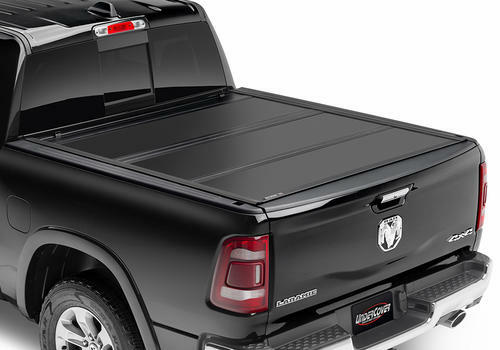 The tailgate can be opened and closed with the cover in the shut position. Yes. 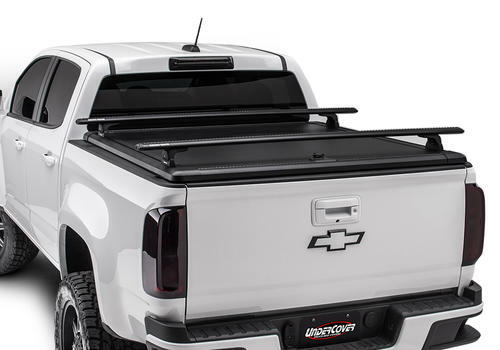 The RidgeLander rests on top of the tailgate for easy access to the bed when loaded. How secure is the RidgeLander? The RidgeLander has a top side lock that is only accessible by key. How do I lock the RidgeLander if my truck does not have a tailgate lock? The RidgeLander locks in place using rotary latches. 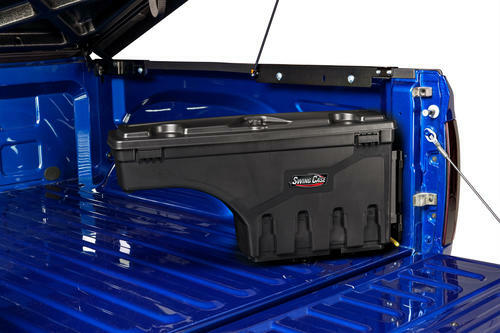 The cover can be locked, but we recommend a tailgate lock to ensure your cargo is secure. The RidgeLander is weather resistant. 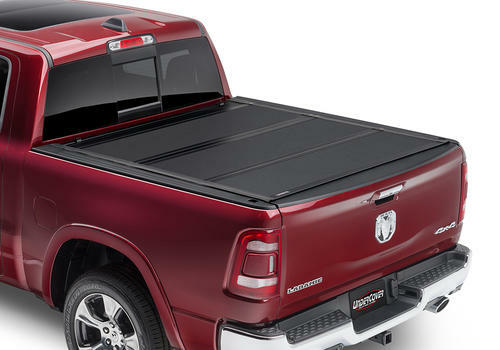 Each cover boasts seals that rest on the bed caps to help keep water out, but there are gaps in the tailgate that may allow some moisture into the bed. Remove the battery pack/switch panel from the hook and loop attachment. Unscrew the screw and replace the batteries. How much weight can the SwingCase hold? We rate the SwingCase at 75 lbs. 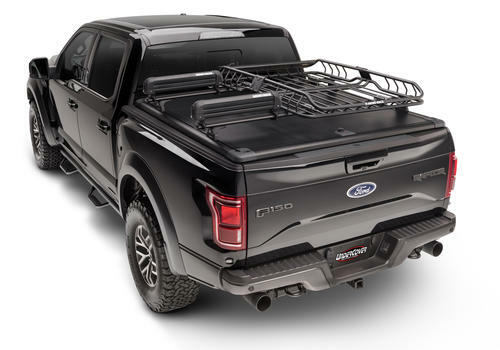 Can I install the SwingCase in a different truck? No. Each SwingCase is specific to each individual application. Can I get Driver and Passenger side SwingCases keyed alike? Yes. Simply call our customer service department at 866.900.8800.